I ran across these photos and thought I'd post them again. I put a sugar block on every hive that is in a single or when the cluster is near the top of the hive. Mix together about 1/3 of the sugar and vinegar at a time in a five gallon bucket with a large drill and paint paddle mixer. If you try to mix it all at once, you will get uneven moisture distributation. Mixture will feel very soft, but not wet or sticky. I use a shallow aluminum baking sheet that fits right into my Cabelas food dehydrator. 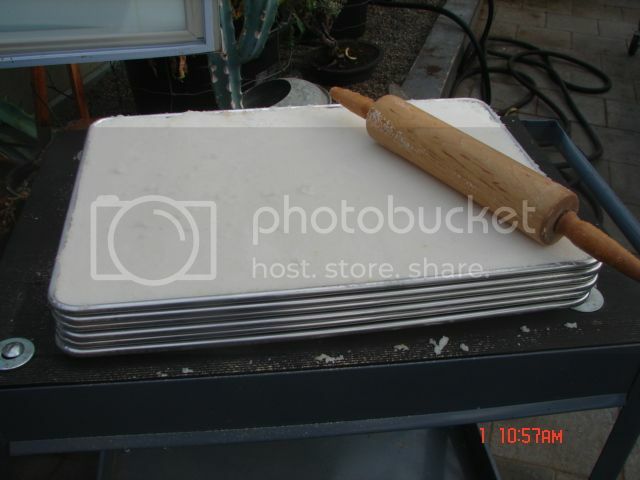 You can use any size pan you want, but be sure your bricks are no taller than your frame extension under your inner cover. Here I sprinkled some dry Beepro on the bottom of the pan.Don't do it, it just gets gummy. Sugar will not stick to the pan after it has dried. Be SURE to cut the sugar into block sized before it hardens. You'll never do it after it's hard. 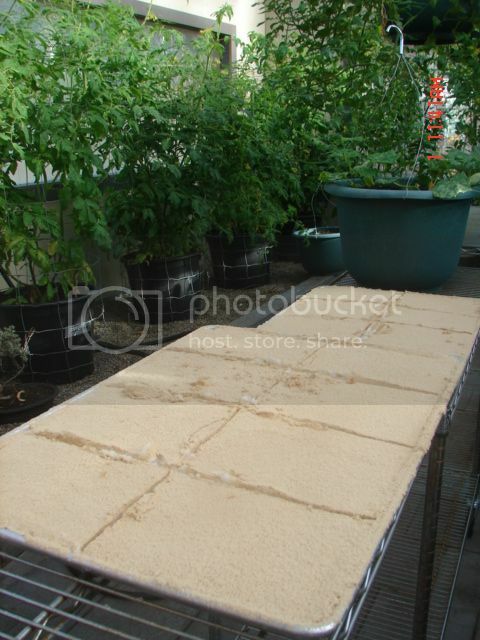 It takes about 2 weeks sitting out in the unheated greenhouse to harden. Here is the application and overwintering results. Heer is a double nuc with a large volume of bees. Even hives that are heavy will still consume this block. I was surprised they would do so, but it didn't worry me they would reserve their natural stores for spring when they started raising brood. And that is exactly what they did. 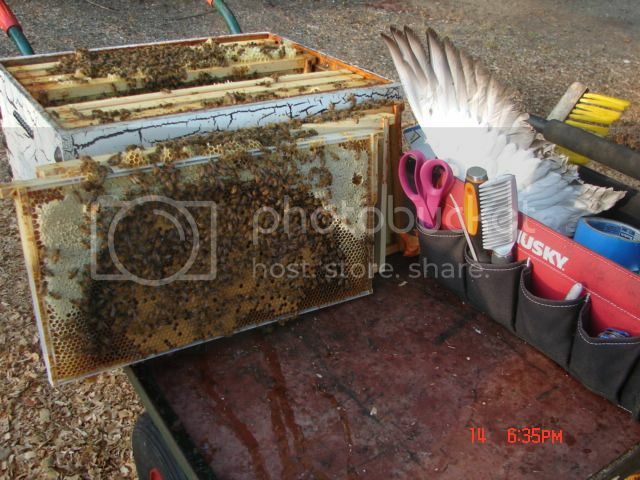 Here is a photo of a hive that was just bursting at the seams in a single deep late summer. In Sept. Relucently, I threw on an undrawn shallow and left for hunting for 2 weeks. I was surprised to see by the time I got back they had drawn and filled the center of the frames. So now..dummy..I thought, now they get to go through the winter with empty new frames on the outside. DOH! Here is another good example of feed directly above the cluster. Although the bottom deep was packed and heavy, they still seemed to appreciate the sugar. All the hives I put sugar blocks on treated them the same they consumed the middle of the block first, directly above the cluster. The condensation from the cluster forms syrup droplets on the brick. Easy for them to take up. 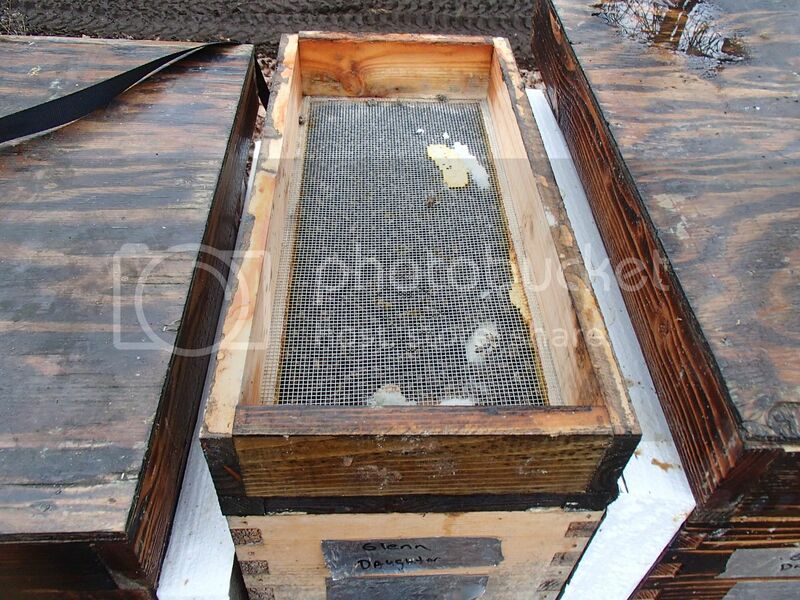 Every hive I had, when checked in late winter has open syrup in cells near the brood nest. With no flow that time of year, I attribute this to the sugar brick. Feed on the top bars, directly above the cluster is very important. I wouldn't use the frames filled with sugar as a reliable feed source overwinter. But it fills up the empty spaces within the hive. And as you can see, do eventually get to it. This frame is in early spring. Below the sugar is new larva and eggs, then pollen. Actually a nicely worked frame. Did they eat the sugar, or haul it out? I don't know for sure, but saw no evidence of sugar granules on the bottom board or entrance area. My bees are all very dark Northern bred with Carniolan genetics in the background. I overwinter in large colonies, which appear to be frugal with their stores. You might not be able to get away with overwintering Italians this way. I feed my bees fortified syrup and protein patties during late summer dearth. 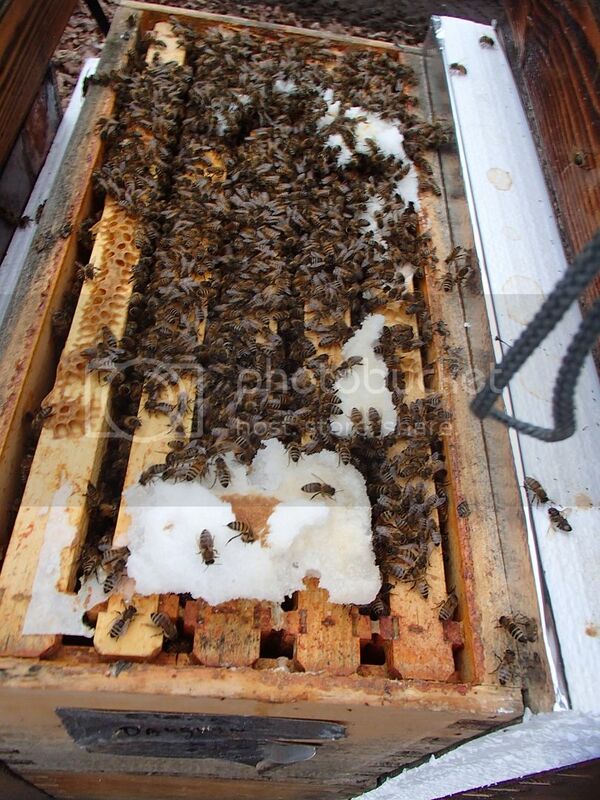 Large hives heavy with stores get just enough syrup to keep brood rearing somewhat active. Nucs get fed regularly. I go into winter with a lot of young healthy bees and heavy hives. My climate, although wet, is fairly mild. My bees can get out for cleansing flights on a regular basis. There has been some discussion previously on Beesourse that feeding sugar during winter months causes dysentery. I have never had one case of dysentery, ever. I never treat with fumagillin, ever. 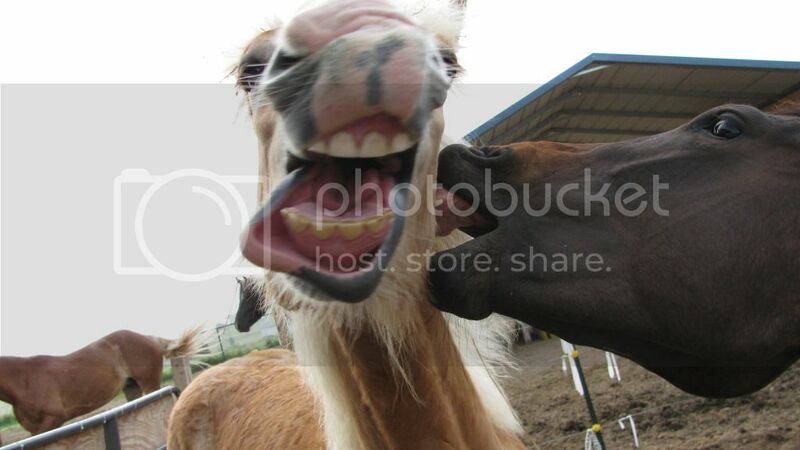 I do however put cider vinegar in every feed I provide to them. I go through several cases of cider vinegar a year. I wouldn't spend the $$ if I didn't think I got a benefit. 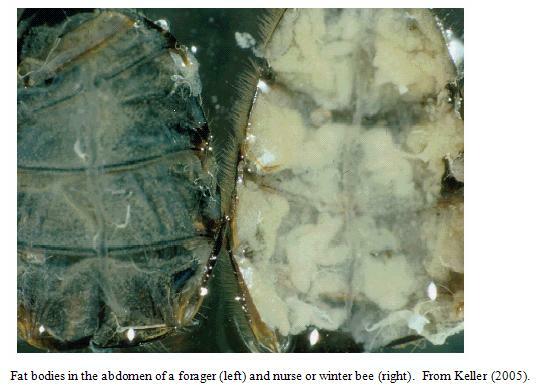 Northern colonies have to endure a fairly long winter inactive period. Use REAL cider vinegar, I might add. Not Cider FLAVORED vinegar. It is possible, these sugar blocks are not necessary. But I don't have the years of experience some do, and feel comfortable with the extra security. I had excellent overwintering results. Hope this helps with your winter prep. Others feel free to add recipes and your techniques. Last edited by Lauri; 11-13-2013 at 07:32 AM. 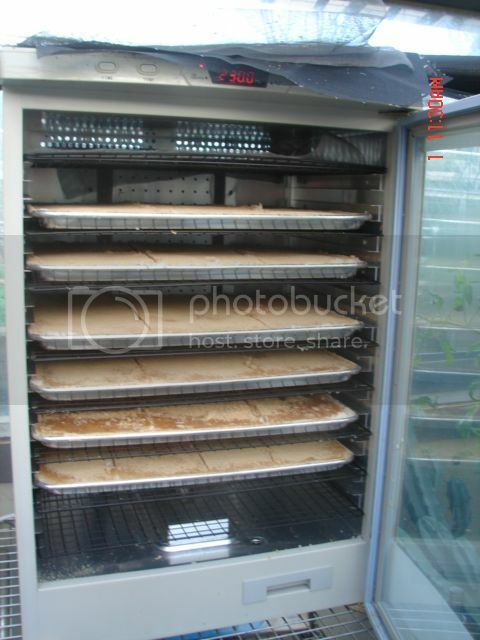 If one does not have a dehydrator or greenhouse available, could the pans be put in a conventional oven on low heat to harden the sugar blocks? Sure, Just set it on low for several hours. These Cabelas food dehydrators are very handy to have though. I have even put frames of honey/open nectar in them overnight to be sure the nectar has a low enough moisture content to they won't ferment in storage. Just set it low enough so the wax doesn't melt and walk away. They are digitally controlled and temps are consistent. I've even hatched chicken eggs out in them, in a pinch. They are a little spendy, but I see them regularly in the Cabelas bargain basement for half price. They are indispensable for dehydrating food and making jerky. And that my friends, is straight from the horses mouth! Last edited by Lauri; 12-15-2013 at 05:41 PM. My, what big teeth you have Grandma. How thick are your blocks? 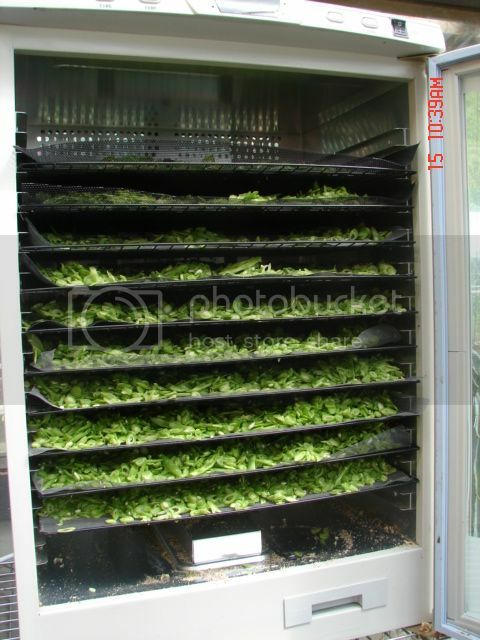 I tried this way ..used a rack dehydrator..and found it took forever to dry...then it cracked. My trays are about 1.75 inches deep. Okay, I confess! I don't have a clue what "cider-flavored vinegar" is! To make pickles and a bunch of other stuff I use the ordinary Heinz Cider Vinegar that has the 5% acid level. So is that the "real" cider vinegar or the "flavored" one? Rusty Hills Farm -- home of AQHA A Rusty Zipper and Rusty's Bees. Actually, in my area, the gallon size Heinz is Apple Cider flavored vinegar. I believe apple cider flavored vinegar is made from grain, while pure apple cider vinegar is made form apples. Three Monks brand is the only pure apple cider vinegar I have found. "Vinegar with apple cider flavoring, often contains the ingredient natural apple cider flavoring, and may also contain the ingredient caramel coloring. (possibly spelled charamel depending on the brand). Basically you are drinking vinegar that has been flavored and colored to look and taste like apple cider vinegar, as a cheaper alternative, and less acidic alternative to traditional apple cider vinegar. Drinking apple cider flavored vinegar, won't give you the same health benefits as drinking apple cider vinegar will. In fact, you are basically drinking straight up vinegar with artificial flavors and colors added, think of it as a kids juice box with "add in's" in it so to speak." (NaturalNews) Apple cider vinegar is often looked upon by natural wellness enthusiasts as a panacea for all good things. Taking a tablespoon or two of it every day is said to cure everything from gout to allergies and more. It's said that it is important that the apple cider vinegar you take be organic and have the "mother" in it to be of most benefit to you. The mother is a stringy-looking ball of matter that either floats at the top or settles at the bottom of a bottle of the vinegar and is the source of its sour, fermented taste. Many companies are now creating apple cider vinegar drinks that contain fruity flavors to mask the sometimes harsh flavor the vinegar has on its own. The age of apple cider vinegar as a health tonic is truly here, and while there is only anecdotal evidence that it actually cures many of the things it is said to, there is also plenty of evidence of definite health benefits in other areas. Here are some of the best documented and strongest health benefits of apple cider vinegar. This is a proven apple cider vinegar cure. The probiotics in the vinegar help ease diarrhea and the pectins from the apples in the vinegar ease stomach cramps. Mix a tablespoon or two in water or your favorite juice to get the best results. Another proven health benefit is its ability to stop indigestion before it starts. Simply mix 1 teaspoon of honey and 1 teaspoon of apple cider vinegar in a cup of water and sip it slowly a half hour before you eat something you know will cause you indigestion. You'll be surprised that you feel fine after eating! This old folk remedy has a long history of proof to its effectiveness. Simply mix a tablespoon of apple cider vinegar with honey to taste before going to bed and drink it slowly. Those nighttime cramps shouldn't bother you anymore. Do this every night before bed for continuing results. Do you have a stuffy nose due to allergies or some other reason? Fix it with a teaspoon of straight apple cider vinegar in a cup of water. The harshness of drinking the vinegar without any flavoring will help drain your sinuses and clear your nose. Apple cider vinegar is excellent for beating exhaustion. The amino acids it contains counteract the buildup of lactic acid you can get after exercising or other intense physical activity. It's also full of electrolytes that help eliminate that tired feeling. Electrolytes are the same thing that are in sugary sports drinks. A teaspoon of apple cider vinegar in chilled water has the same energizing effect without the sugar and artificial colors and flavors. Apple cider vinegar is also good for treating heartburn, easing the pain of arthritis, whitening teeth, and much, much more. There are entire books written on the miracle of apple cider vinegar. Even though many of its supposed benefits only have folklore to back them up, there is enough concrete evidence of its many benefits that many people take it every day as a general health tonic. Anyone looking to maximize their health could definitely benefit from a daily dose of this amazing amber liquid. Last edited by Lauri; 11-02-2013 at 06:30 PM. Okay, so I looked at the label and it says it is made from apples! The contents are apple cider vinegar and water. Sounds like that is the real deal, then. Thank you both! I learn something new every day! I made sugar cakes last winter, but did not use vinegar, just water and sugar, I watched some youtube videos and did it that way. They did crack, but I use them in small chunks sometimes anyway. I had a lot left over so I'm using them for this winter too - it doesn't look like they have deteriorated at all. Yesterday was a pleasant day, tonight it's supposed to get to 17*F, so I popped the lids yesterday and put extra sugar cakes in there, directly on the top frames (with those thin wax foundation papers under it to keep it from crumbling into the hive) thinking this is probably all I'll do for winter feeding. Pretty much ready to close everything up for winter. The dysentary (sp?) is a concern. I hope that doesn't happen. Heres a short video showing feeding of the bricks late winter. The bees started coming into the rabbit barn and getting into the cracked corn, so I took that as a sign it was time to give them protein. The results showed the timing was good. With 25# of sugar I only use about 1/2 tsp. 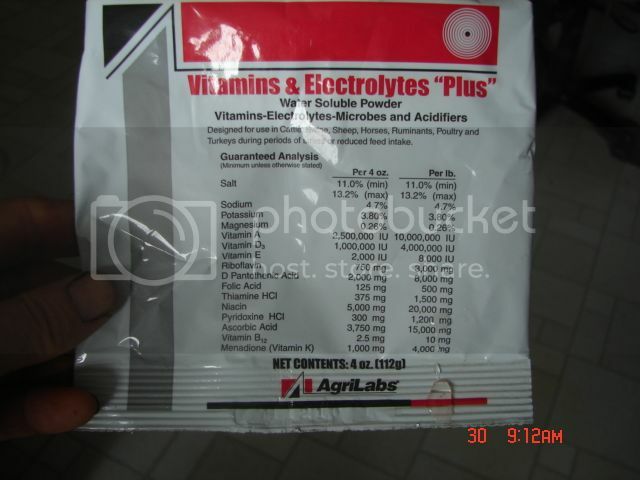 of the electrolyte mix. If I remember right, a full package will make 220 gallons of livestock diluted strength water. I'm careful not to use too much. I started out with just a small sprinkle. Worked up to 1/2 tsp. You can smell the vitamins in it. I think that is enough/not too much. You can also add a Tablespoon of citric acid if you have it, Get it in the canning dept of you local store. A primary reason for acidifying syrup is to "invert" the sugar. Cane sugar is pure sucrose. Sucrose is a 12 carbon sugar made up of two loosely joined six carbon sub-molecules (fructose and glucose). The acid disassociates the sucrose into the component parts, mimicking the nectar. 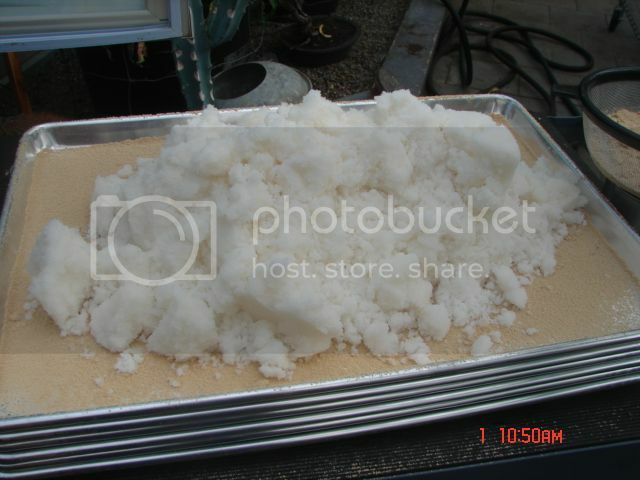 This is termed by kitchen chemists "invert" sugar, and was used for baking. Most nectars (not all) are slightly fructose rich. The pH of nectar varies widely too (and many nectars, not co evolved with honey bees, have large components of indigestible (by bees) seven and greater carbon sugars. Practically, the sucrose sugar syrup can be inverted with vinegar or any other edible acid, and very little hydrogen ion donors are needed on the order of tablespoon per gallon. Ascorbic acid is made up of glucose (6 C sugar ring) with 2 carbon "tail" and various OH groups tagged to balance the Carbon charge. Many animals and their gut flora can synthesize this from any 6 carbon sugar source. A good reason to use at least some ascorbic acid (or tartaric) in the place of some of the simpler acids is ascorbic is a ring structure, while acetic (vinegar) is a simple unbranched chain. The ring is stable and "recycles" Hydrogen OH groups from solution. This means it is continually recovering donor potential and a little bit can invert an enormous solution much like a catalyst in reaction. I don't remember who wrote this so I can't give them credit. Nice info though. Even though this sugar brick is a very small amount of feed, aprox one or two quarts of 2:1 equivalent, I believe it is the placement of a slow but consistent syrup availability that keeps the hive in just a little better shape. It might even just be their attitude that gets the benefit. But a colonies attitude or enthusiasm coming out of winter can make a big difference if you want them to build up well and fairly early. Here is another typical double overwintered nuc. The thing I notice is, my hives come out of the winter with about the same volume of bees it went in with. And the bees are young bees, not those giant old bees. If you look closely, you will see them starting to try to build up in the center of the remaining sugar block. Their numbers were large enough to take advantage of our early spring Maple flow. A hive on the increase in Western Washington state in February/March is not typical. Our season is short here and early increases are essential to the productivity of my season. I never get chilled brood form a late cold snap, because there are plenty of bees in the hives to keep the building brood warm. I can make early splits and populate my mating nucs because I have the volume of bees to do it. I have to keep my eye out for mite loads with early brood rearing, but they have not been a big issue. My worst few hives I had for mite loads this fall were surprisingly, a cut out from a giant cedar tree and two swarms I collected. We haven't worn our full suits for a few years, but I figured when we started hacking away with the chain saw they would boil out of there. They were very quiet. Yes, we got the queen. Here is a video of what I am talking about. This was taken March 3, 2012. Remember, I am near the Canadian border. You can see an active colony with capped honey, open nectar and brood. Last edited by Lauri; 11-03-2013 at 08:53 AM. > I don't remember who wrote this so I can't give them credit. In the first video above you are feding brownish blobs of "pollen patty". Could you, please, share a recipe for that? I plan on making some sugar bricks this week as it is too cold now where I am to continue liquid feeding. 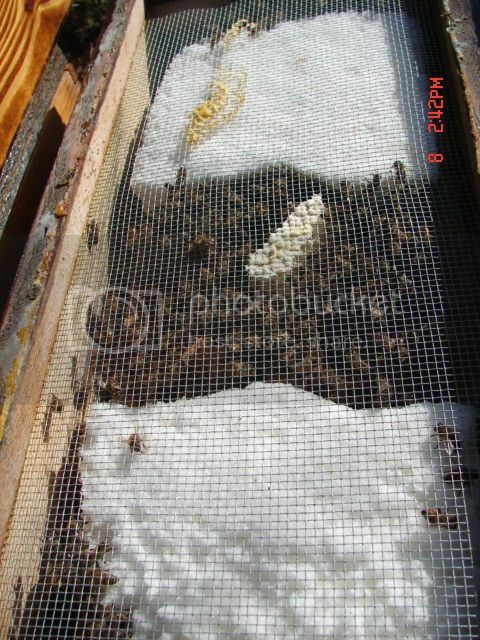 I use BeeMax styrofoam top feeders. About ten days ago I let them finish the liquid and removed the plexiglass dam that keeps them from drowning in the liquid. I happened to have some opened honey comb left from another project with a fair amount of residual honey in the cells. 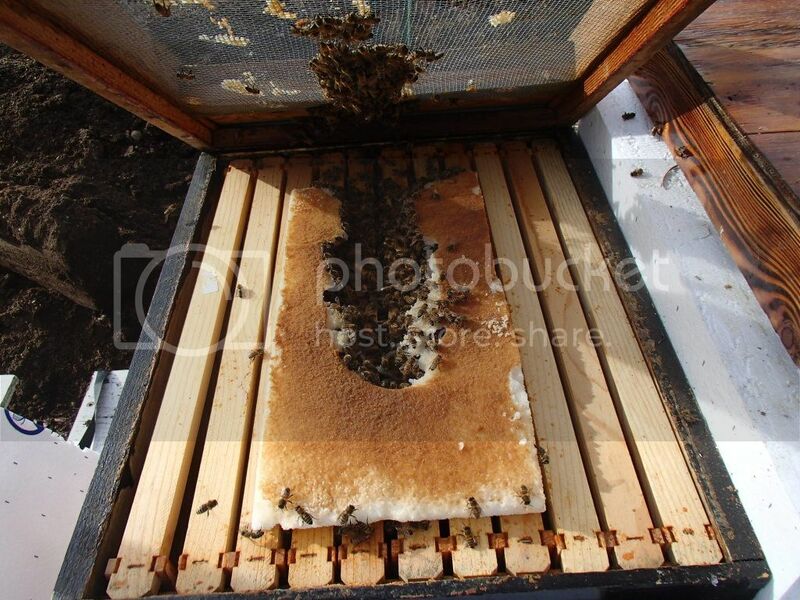 As an experiment I laid the comb sections on the floor of the feeder and allowed free access to it from within the hive. 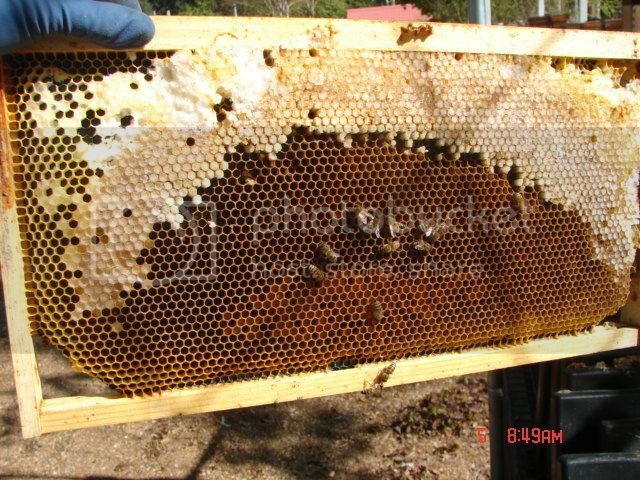 While the girls were happy to get it, I noticed that after really cold nights I had dead bees in the feeder and on the comb. I think that they got too cold and remained on the honey when they should have gone back down into the hive, but were too honey-drunk to care. So, that's the end of that experiment! Back to the idea of feeding sugar cakes laid directly on the upper level of the supers, so I was pleased to see your recipe. Pollen patties later in the winter, right? Both the recipe in this thread and the patty recipe in the thread above are heavy with apple cider vinegar. Now, I'm not the brightest bulb on the string, you understand, but I am troubled by this a bit. The object is to have "fat bees" coming into spring, right? Because they need something they store in their own body fat to help feed the spring brood, right? Except ACV is supposed to be this great fat FIGHTER that encourages leaner bodies in humans. So isn't a heavy usage of ACV actually counter to what we are trying to do, namely have "fat bees" coming into spring? I'm not suggesting we not use ACV at all (there's a lot of good stuff in it). Rather, I am wondering if we shouldn't be using it in smaller quantities? Like I said, I'm not the brightest bulb out there, so maybe I am missing something vital here. Thoughts anyone? I don't think anyone's trying to get obese bees. I don't think it's even possible to accomplish such a feat. "Fat bees", I believe, is just a poetic way of saying "well-fed" or healthy. I can't claim to read into the minds of the people who shared their recipes, but I've heard of a number of reasons for using apple cider vinegar, such as staving off fermentation and adding essential minerals. There's another thread that talks a lot more about vinegar which you might find interesting. Bees not only store pollen and honey in the combs, but they also store food reserves in their bodies. This is done mainly in the form of a compound called “vitellogenin.” vitellogenin is classed as a “glycolipoprotein,” meaning that is has properties of sugar (glyco, 2%), fat (lipo, 7%), and protein (91%) (Wheeler & Kawooya 2005). Vitellogenin is used by other animals as an egg yolk protein precurser, but bees have made it much more important in their physiology and behavior, using it additionally as a food storage reservoir in their bodies, to synthesize royal jelly, as an immune system component, as a “fountain of youth” to prolong queen and forager lifespan, as well as functioning as a hormone that affects future foraging behavior! A 2009 study on mice showed that consuming acetic acid (the active component in ACV), upregulates the expression of genes for fatty acid oxidation enzymes in the liver causing a suppression in body fat accumulation. ...then are we undoing the vitellogenin accumulation in our overwintered bees when we add a lot of apple cider vinegar to their winter diet? Since I don't have a clue of how to find the answer to my question, I naturally asked it here, since there are so many people here who actually know this stuff! Last edited by Rusty Hills Farm; 11-10-2013 at 09:38 AM.